There are but a few iconic California Pinot Noirs. Rochioli West Block, Hanzell Ambassador’s 1953 Vineyard, Calera Jensen, and Mount Eden to name some of the few. Pisoni Vineyard Estate Pinot Noir, known as “Pisoni, Pisoni,” is one of the elite members of this fraternity. Gary Pisoni planted his first five acres of own-rooted vines in virgin soil at 1,300 feet elevation in the Santa Lucia Highlands in 1982. The original vines are rumored to be suitcase cuttings from a famous Domaine in Vosne-Romanée now referred to as the Pisoni selection or “clone.” Pisoni Vineyard fruit quickly became highly prized in California, and it is not an overstatement to say Pisoni Vineyard put Santa Lucia Highlands on the map. The Pisoni Vineyard is one of the highest-elevation vineyards in the Santa Lucia Highlands. 36 acres are planted with 30 individually farmed blocks. The soil is decomposed granite with high amounts of schist and quartz. There is a significant cooling maritime influence that includes fog. The vines are sustainably hand-farmed. 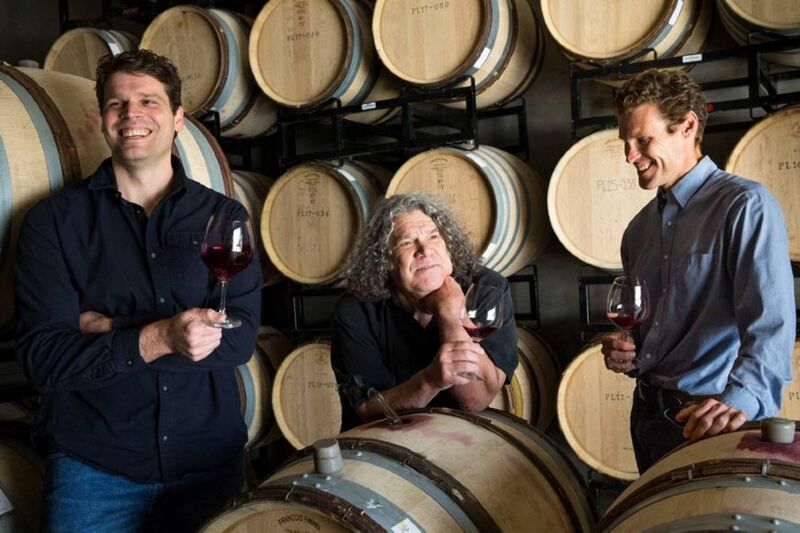 Gary’s sons Jeff (the winemaker) and Mark (the winegrower) created the Pisoni label, releasing the first Pisoni Estate Vineyard Pinot Noir in 1998. The Pisoni family essentially produces one Pinot Noir each year under this label. The wine is a blend of several blocks on the estate. Total production ranges from 500 to 800 cases annually, depending on yield. (Left to right - Jeff, Gary and Mark). A Pisoni Vineyard Estate Chardonnay, produced from vines that include initial plantings dating to 1982 and some blocks planted in 1999, is also offered. I rarely write about a single wine, but the 2016 Pisoni Estate Pinot Noir deserves the honor. In 2016, there was limited rainfall so that roots had to dig deep for moisture. The result was bold tannins and intensity that required careful managing. The conditions in 2016 necessitated that the Pisonis drop a considerable amount of fruit so as to not overly stress the vines. The resulting yields were only about two tons per acre. After harvest, Jeff’s top priority was watching the tannin evolution during fermentation. The fruit had robust structure, so punch downs were restricted to the beginning and middle of the process with less at the end. The wine was produced at a custom crush facility in Rohnert Park, CA. Pisoni Estate Pinot Noir and Chardonnay are only sold by allocation to the winery’s mailing list on an annual basis. Visit www.pisonivineyards.com. Since the demand for Pisoni Estate wines exceeds production, new applicants to the winery’s mailing list may have to wait for a few vintages before being offered wine. I wish more Pinot lovers could taste this wine. 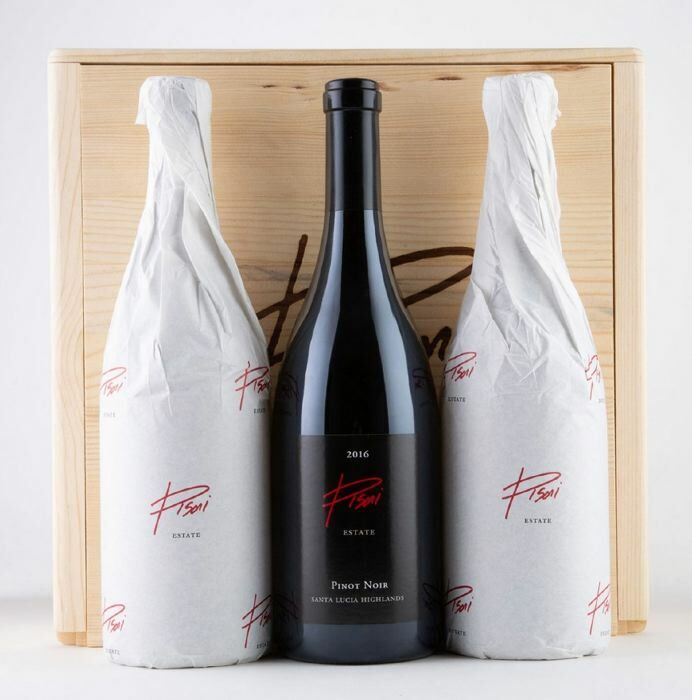 Pisoni Estate wines are sent in a classy wood box encased in black styrofoam with each bottle individually wrapped in tissue. The Pinot Noir is typically rich and powerful, but with well-tamed tannins. The wine benefits from decanting for 30-60 minutes after opening. I reported on a vertical tasting of Pisoni Estate Pinot Noir, 2004-2014, in 2017: www.princeofpinot.com/article/1903/.